Loblaw, the largest food distribution company in the country, is now selling cricket flour. The product itself is not new, as many speciality stores have been selling it for a few years now. But Loblaw is the first major retailer to sell the product under its own private label. For Loblaw, who’s head office is located at 1 President’s Choice in Brampton, Ontario, this is not a decision that was made lightly. Given the growing number of consumers looking for protein alternatives, beyond the meat trifecta of beef, pork and chicken, selling cricket flour is a sign that the protein wars in Canada may have reached a new level. Most of the world’s population, about 80% of us, eat bugs regularly. In the Western world, however, this is still not mainstream, mainly due to the creepy-crawly factor. The fact is, though, that we have all eaten bugs at some time, deliberately or not. Food safety research has shown repeatedly that bugs regularly get into the human food chain, through grains, vegetables, fruits, or other means. Food safety perfection is just an ideal, but bugs are not harmful either. Furthermore, other research has also suggested that over a lifetime, the average human could eat up to 8 bugs alone merely while sleeping.. Disgusted enough yet? Bugs surround us, whether we like or not, but to collectively accept them as an integral part of our food supply chain is still a psychological stretch. For Loblaw though, it is about health and sustainability, and the case for using crickets is actually very compelling. A 2.5 tablespoon serving has 90 calories and 13 grams of protein. It also contains enough B12 vitamins to carry you through the day. Per kilogram, crickets contain as much protein as pork. The University of Oxford published a very compelling study on the nutritional value of crickets versus meat products. When measuring protein content, vitamins, sugar, and fat, crickets ended up ahead in most categories. While some studies may have pointed out some of the limitations around cricket consumption, scientific consensus is building. Not surprising then, that Loblaw has been looking at this for a few years already. Market-wise, Loblaw is testing consumers current curiosity and willingness to explore new dietary options. But, they are not exactly giving the product away. When launched, the retail price point was almost $16 for a 113-gram bag. Interestingly, the price dropped to $14 just a few days later. Given how inexpensive cricket production is, margins are likely high because of the shelf space that is sacrificed to stock this item. Cricket flour can be used as an added ingredient for smoothies, yogurt, soups, oatmeal, and baked goods, among many other things. And with its neutral flavour, it won’t spoil the taste. But Loblaw is bold to put a picture of a cricket on the same package as its prized President’s Choice brand logo. Part of the reasoning behind consuming crickets is that insects are better at converting feed to protein, compared to larger livestock. Entomo Farms, based in Norwood, Ontario, supplies the product to Loblaw. Operations in Norwood have grown by 12 times since 2014, as the demand for crickets is growing exponentially. Because crickets can reproduce very quickly and take up very little space, it an incredibly efficient crop. Currency for crickets is rising, on both sides of the supply-demand continuum. This shift also speaks to how our relationship with food is changing in general. Aesthetics, flavour, price and convenience remain the major factors in choosing the food we eat. But the nutritional content of every single ingredient in our foods is gaining more attention. From our western perspective, crickets do not look appetizing, but neither did lobster at one time. Lobsters used to be known as the cockroaches of the sea, but now are consumed as a delicacy. Demand is also up for weird-looking species like octopus. While bugs have yet to make it into mainstream Canadian cuisine, they are regularly included in meals in countries like China, Mexico and Thailand. At the core of it all, Loblaw’s primary motivation for doing this is likely to put into practice the concept of whether some efficiencies can be enhanced by managing protein differently across global protein supply chains. Even if several studies dispute the nutritional value of insects and may not see them as a viable source of protein, animal protein remains under severe pressure, as pro-livestock factions know only too well. Loblaw is also hedging against the questionable future of animal protein. Health Canada will be releasing a new food guide and based on principles disclosed last fall by the public regulator, its seems Canadians will be invited to think twice about their level of consumption of proteins, specifically from meat and dairy. Many have probed current livestock practices and have registered concerns around the environmental footprint, ethics and health value of meat. If crickets, or other insects, are to become part of our dietary way of life in Canada, it would probably be as a potent supplementary ingredient, not necessarily as a raw comestible food product. 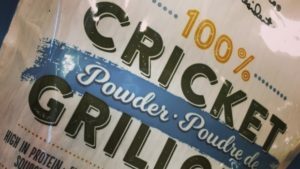 I is highly unlikely that steaks, chicken wings or pork chops will be replaced by a plateful of crickets any time soon, but ingredients sourced from the start of the food chain are starting to take their place in the retail market. There are no short answers to economically relevant production models in food anymore. But with sound research, we are slowly accepting the fact that protein intake can come in several forms.